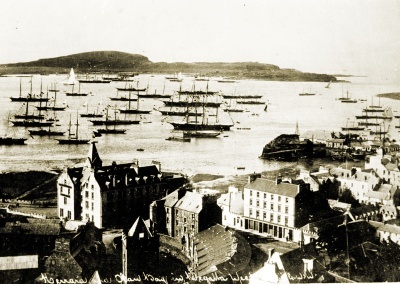 West Highland Yachting Week’s history reaches as far back as 1882 when the newly formed Royal Highland Yacht Club held its first regatta in Oban. Picture the difference then with only two classes – one for yachts under forty tons and the other for those over forty tons! In 1947 Royal Highland Yacht Club joined forces with the area’s other local clubs, Oban Sailing Club and Western Isles Yacht Club, to bring their separate regattas together and hold one major event. Each club contributed two days of organisation to provide a six day regatta. In due course it was agreed to hand over the management of the event to a Joint Regatta Committee (JRC) comprising representatives from each club with additional co-opted expertise. Sadly, due to changes in the aims of the Western Isles Yacht Club they no longer form part of the JRC. In 1980 West Highland Yachting Week entered into a 30 year long sporting partnership with Tennent Caledonian Breweries. In more recent years the JRC has formed a firm association with Tunnock’s who have acted as the main sponsor of the event, with additional sponsorship provided by Argyll and Bute Council, and Tobermory Harbour Association. More recently additional support has been added by Owen Sails, Malin Waters, Gael Force Marine Equipment, Scottish Canals, Dunstaffnage Marina and Webcraft UK Ltd. This popular mix of the serious and the not so serious continues the tradition begun at the very first Regatta in 1882 when, in addition to yacht racing, the event included rowing races and ended with a ‘Duck Hunt’ – which seems to have been some sort of pursuit race! In the evening yacht owners and their guests attended a huge Highland Ball that mirrors our own prize giving dance. This is perhaps not quite the dazzling event of those early years, with the guests in their full finery, but it is not so easy to carry full Highland Dress aboard today’s somewhat smaller yachts. Of course, in those days it would only have been the owners attending the ball – the crews (paid, naturally!) would have been expected to entertain themselves at the local public house! The pub tradition still continues – now for owners and crew alike – with the added entertainment of a wide ranging social programme to accompany the ‘craic’ and camaraderie that is so much part of West Highland Week.